Ask out-of-the-ordinary questions – If you catch someone off-guard with a non-standard question, you can jolt them into a deeper response and make yourself more memorable at the same time. Be professional – No matter how you choose to start a conversation, keep it professional. Remember that you will have a different conversation with a customer than you would with friends and family. Don’t ask questions that are potentially embarrassing or that might make the other party uncomfortable. Be relevant – Find a topic about something timely or specific that requires comment. Many sales reps open with a sports question about last night’s game or the prospects for a local team. You also can comment about relevant local events, interests, a specific location, and so on—just don’t start with the weather! The objective is to prompt a response and make it easier for the other person to contribute. “How do you know John?” This is a common approach when you can identify someone you both know. LinkedIn is a good resource to identify contacts you have in common. Note that this is an open-ended question; it’s relevant, since it is specific to this conversation; and it is memorable because it shows you have a mutual contact in common. “What do you see as your major business challenges in the coming year?” This is a great question that will give you a lot of insight about the prospect and how to present a viable solution. “I saw you had a great quarter.” Being informed about the company, its products and services, and its latest achievements and milestones before you make the sales call can establish important touch points. This is a professional, relevant starter that should open the door to discuss the company’s growth strategy and points of pain. “Did you see the recent article in Industrial News Today predicting slower growth in your market?” Sharing relevant content from an expert source shows that you are on top of market trends, which gives you credibility. It also gives you a chance to talk about well-understood challenges or issues that are relevant to the sales call. “How have you been?” This may seem trite but for cold calling this kind of opener can increase the chances of booking a meeting by 6.6 times. The reason it works is it is unexpected in a cold call; it disrupts the pattern. It also a common, socially acceptable question that isn’t threaten but requires a response, which triggers engagement. 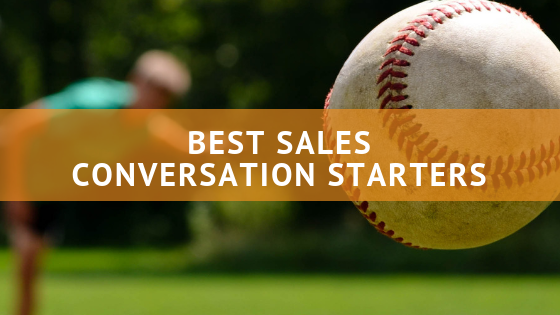 These are just five of our best sales pitch examples, but they illustrate the kinds of questions that will promote conversation and deeper engagement. Phone – When calling a customer or prospect, refer to past touch points. Draw from the last phone conversation or what you know about the customer and his company. Also remember that telephone calls can be intrusive. Be sure to check if the customer is busy and be respectful of their time. Voicemail – Actually reaching a customer by phone can be challenging, so you may have to leave a message. When leaving a voicemail, remember to be succinct and professional. Consider preparing a voicemail script in advance. How you leave a message will set the tone for later business interactions. Email – Electronic mail has become the most common form of professional communication, and as a consequence, most customers are drowning in email. To get their attention, be friendly and personal. Use the subject line and opening of the email to say something about the customer that will get their attention. Always follow up a voicemail with an email. We have offered a few sales pitch examples here, but there is no better teacher than experience. Outsourcing your inside sales team allows you to benefit from lessons learned by seasoned experts who have been there and done that. One thing we know for sure is that the best sales pitches start long before you pick up the phone; and continue long after the first transaction has been complete.